Nokia 9 was leaked a couple of days back via the hands-on images along with the camera samples. That leak revealed everything from the specifications to the camera quality and also some key factors regarding the design. Today, the phone was spotted on Geekbench 3, and it destroys the competition out there including the Galaxy S8/S8+ and the Mi6. Yes, Geekbench has got version 4 now, but still, the Geekbench 3 scores of Nokia 9 are way better than the S8 and Mi6 that shows it is going to be a tough competitor for both the phones as well as for the upcoming flagships. 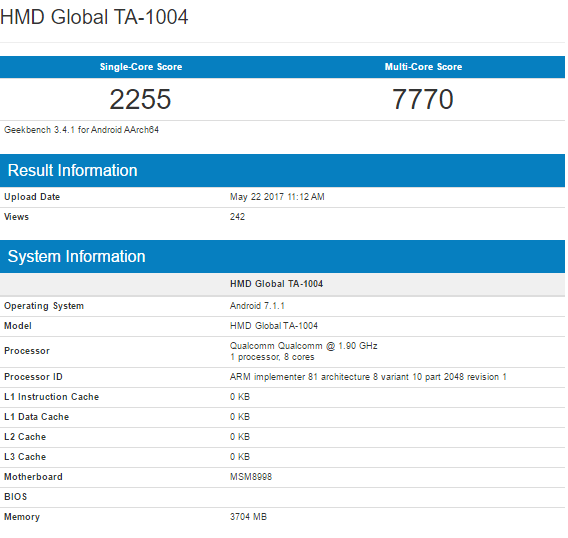 Listed as HMD Global TA-1004, the device has scored 7770 on Multi-Core. The Exynos Variant of S8 scored 7252 whereas the Snapdragon 835 variant scored 7202. Talking about other competitors, the Xiaomi Mi6 scored 7598 & iPhone 7 Plus scored 6123. 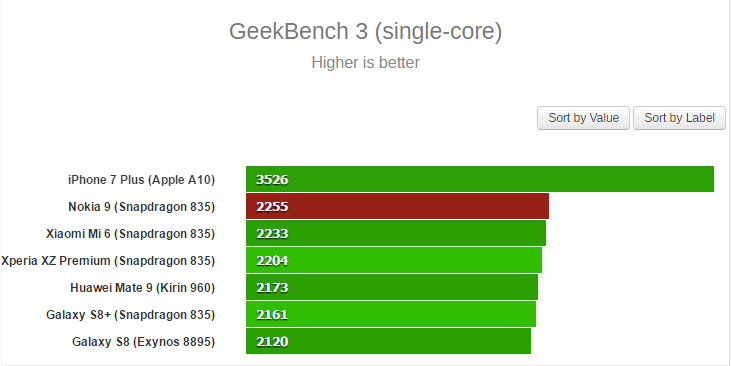 Truly, the phone has smoked its competitors in the Multi-Core test. Coming to the Single Core test, the phone again scored better than the Mi6, XZ Premium, Mate 8 and Galaxy S8/S8+ with the score of 2255, but fails to overtake the iPhone 7 Plus (3526 on Single Core) which is still on the top in terms of Single Core performance, thanks to the A10 Fusion chip. We can say that Nokia 9 is truly the phone we all wanted to see from the company from past few years. It will be interesting to see the real world performance of the phone when it is launched. What are your views after looking at the scores? Do let us know via the comments section.